Also known as "Et la poussière retombe..."
"The prairie wind is not responsible for the dirt flying in this video; the culprits are neighbouring gophers with an un-neighbourly appetite for anger and revenge. Before sundown, the retaliatory rodents have all but obliterated both of their homes... is there any way they can put the pieces back together? When the Dust Settles tackles conflict in a lively, humorous and provocative way. It shows that amidst the chaos that conflicts create, there are still paths to reconciliation. 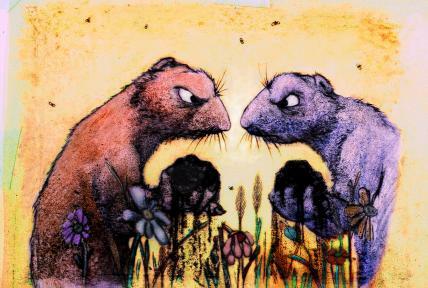 This film is part of the ShowPeace series of lively animated films about conflict resolution. This series has received support from UNICEF and Justice Canada." National Film Board of Canada. "NFB -- When the Dust Settles/Et la poussière retombe...." National Film Board of Canada. http://onf-nfb.gc.ca/en/our-collection/?idfilm=33267.